Williams Sonoma launches coffee capsules. Credit: Business Wire. Williams Sonoma has launched a branded line of capsules that are blended from 100% Fair Trade Certified coffee. The capsules are available in Intenso, Ristretto, Cremoso, Vanilla, Lungo and Decaf Intenso flavours and packed in recyclable aluminium packaging. Williams Sonoma sources the coffee from countries worldwide, including Brazil, Colombia, Costa Rica, Ethiopia, Honduras, India and Kenya. Intenso offers dark chocolate scents, while Ristretto has an intense flavour with hints of citrus and cocoa. Cremoso delivers a spicy aroma with a smooth, nutty finish. The Vanilla coffee capsule offers a full-bodied espresso with sweet, creamy fragrances of vanilla, while Lungo is an espresso with a nutty aroma and black tea flavours. Decaf Intenso presents a subtle fruity aroma. The collection is sold in packs of ten capsules for $7.95 across retail outlets and on the company’s website. The capsules are suitable for OriginalLine Nespresso capsule machines. 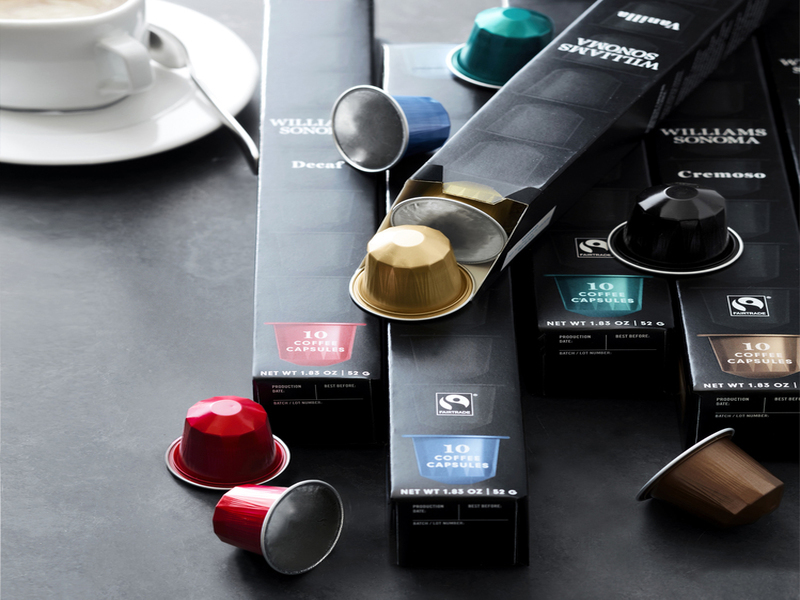 Last July, US-based Peet’s Coffee released a range of flavoured capsules for the Nespresso OriginalLine machines. The range included Ricchezza, Crema Scura, Ristretto and Nerissimo flavours, which were developed to meet the single-serve consumer demand.